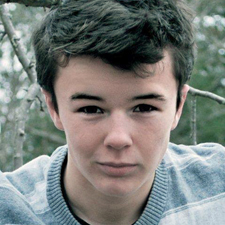 The next talented student in our blog series on our 2011 Anthony Quinn Foundation Scholarship Recipients is Evan Kinnane, a musical theater triple threat (singer, actor, dancer) from Tiverton, RI who is currently home schooled and in the 10th grade. He will be using his scholarship to attend the Boston Conservatory Music Theater Dance Intensive this summer. Please join us in congratulating Evan and wishing him the best this summer and in the future as he builds his musical theater career. I want to always be able to inspire people through art. I would love to be able to have a career that surrounds what has been my passion for as long as I can remember. I love the feeling of knowing that I am able to bring the audience on a journey, and I am able to help them escape, even if just for those few hours, from the stress and chaos of the world outside of the theatre walls. I hope to have the same passion, dedication, and drive for the arts as I get older. Even though dancing, acting, and singing are my main focuses in life, I really do enjoy any other type of art and have taken classes in all different forms of them. Painting, pottery, photography, etc. But out of the context of art, I like to surf, travel as much as I can, wherever I can, and even though it's cliche, it's true, I like to spend time with friends and family, going to the beach or watching movies. I like to try everything, so going new places and trying new things is always appealing to me. That it all happened by accident. When I was just six years old, I followed my sister into an audition to watch and support her as she auditioned for the town community center's production of "Bye Bye Birdie." I had no idea that this would be the day and that this would be the room where my passion for the arts would begin. The words "Can I try too?" changed my life forever. Singing the song "Happy Birthday" landed me my very first role as Randolph in that show, and ever since then, I've been hooked. Click here to see Evan as the featured soloist in "Mata Del Anima Sola" with the Rhode Island Senior All State Chorus, recorded at the Veterans Memorial Auditorium in Providence this past March.